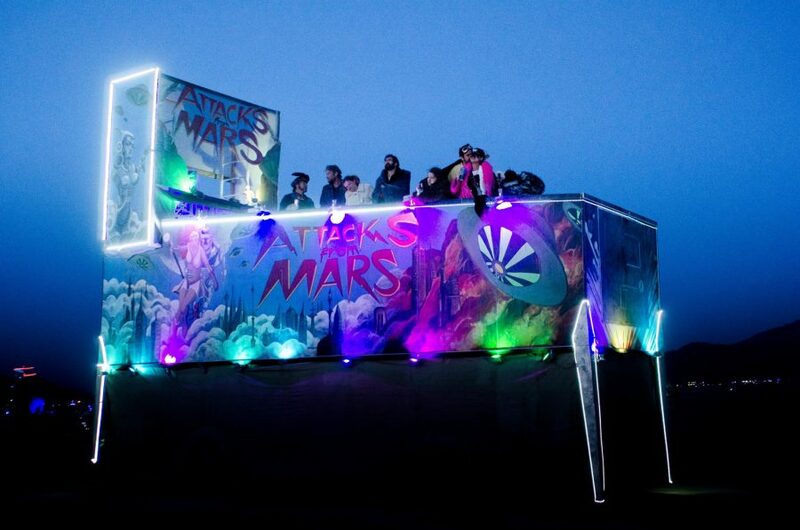 Below are images from our Attacks from Mars pinball machine, made by my art group Recreational Light and Magic, (a Totally Legit LLC), fully assembled for Burning Man 2015 and 2016. This is a three year project — the first year we created the murals and play space, and the second year we focused on night lighting. In the final year we will be making the playspace more interactive. Nighttime View of the Pinball Machine, Photo by Lea Willingham. Fully Assembled Pinball, Right Side. My roles in this project is creative director, including creating the original concept design, programming the arduino for the playspace lighting animation, designing and sketching the murals, and painting the more complex figurative aspects of the mural. 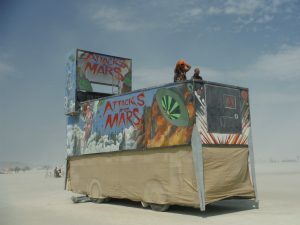 Thanks to the fabulous team who made this possible, including all our “guest” artists who contributed many hours in construction and running the mutant vehicle at Burning Man. Shelly Farnham, Greg Larson, Jeff Larson, Daniel Walker, Andrew Thomas Cross, Lea Willingham, Ben Flaster, Shivers Бред Tb, April Suzanne Denton, Chloe Swanson, Leo Spizzirri, H.B. 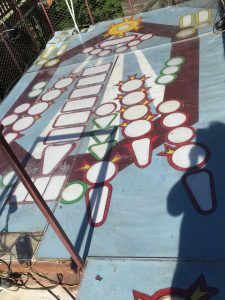 Seigel, Jeanie Lorman, Jonny Star, Cam Jones Manny and many many others!We made a giant pinball bus!